From 22 nd to 28 th of July 2018, 40 students and young professionals followed the invitation of the Institute of Space Systems of the University of Stuttgart to the Space Station Design Workshop (SSDW) 2018. Within one week, the two interdisciplinary teams composed of 20 international participants, supported by experts from industries and universities, tackled the challenge of performing a conceptual design of a permanently manned habitat in the South Pole area of the Moon. Primary objectives of the design were the provision of infrastructure for future Lunar surface exploration and the conduction of scientific operations. Furthermore, In-Situ resource utilization was integrated as much as possible. The results of the SSDW were presented at the 69 th International Astronautical Congress in Bremen (01 st till 05 th of October). Team Blue proposed the “Blue Moon Mission” with a surface base located at the connecting ridge of Shackleton Crater (89.5°S, 144°W). With over 80 percent of average illumination per year and less than ten percent slope, this landing site offers perfect conditions in the proximity to permanently shadowed regions in the crates nearby. Relying on the private space company SpaceX, crews will be launched on the Falcon 9 / Falcon Heavy rockets on board the Dragon 2 capsule. A small refueling station in low Lunar orbit acts as staging point, where the crew changes to a dedicated ascent and descent vehicle to reach the Lunar surface. The design of the station is reminiscent of three donuts with a rigid core and an inflatable ring, covered with loose regolith for radiation protection. With 35 tons and a power budget of 42 kW, the surface base can permanently accommodate a crew of four astronauts, each staying for periods of up to two years. The overall costs of 190.62 billion Euros offer 15 years of operations, starting from 2030, including 78 launches and 42 missions (17 manned, 25 cargo). Team Red envisioned the “DIANA Program” at the rim of Shackleton Crater, with a landing site at the connecting ridge. The separation is due to higher illumination and more scientific opportunities at the base location while the landing site offers less slope and better communication coverage. The infrastructure is based on NASAs SLS launcher and the Orion capsule. Nominal crew and cargo transportation includes docking to the Lunar Orbital Platform – Gateway (LOP-G) at a near rectilinear halo orbit (NRHO). A reusable Moon crane brings crew and cargo to the Lunar surface and back to the LOP-G. The concept suggests a habitat design with three spherical modules, which are also covered with loose regolith. A connected 3D printed dome serves as garage for rovers and as testbed for experiments in vacuum protected from space radiation. The overall mass of the habitat is 36.4 tons and is capable of 70.4 kW power provision. With these parameters, a crew of four can stay in the habitat for a maximum of two years. The program costs 126.47 billion Euros for 15 years of operation, including 65 launches and 60 missions (15 manned, 45 cargo). The results of the SSDW are sent to sponsors and supporters for further review. The conceptual designs of students and young professionals, unbiased from long working experience, are very renowned among the international industries and space agencies. Not uncommonly, follow-up ideas originate from the work of the SSDW participants. 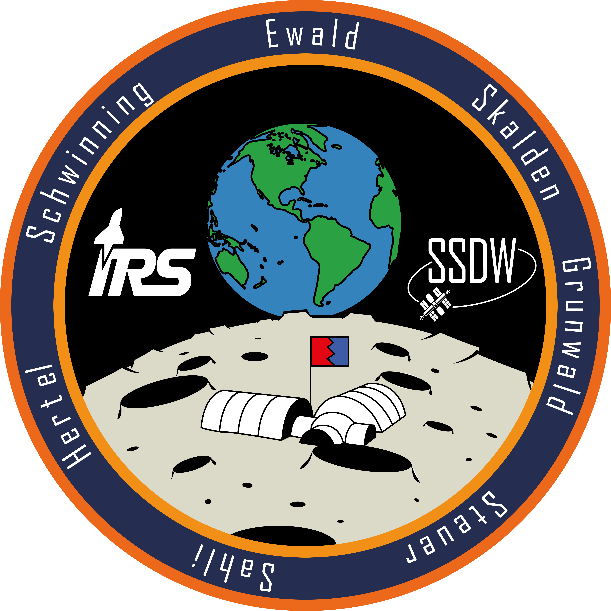 The SSDW is annually instigated at the Institute of Space Systems, applications are usually opened between 01 st of March and 30 th of April. For any questions about the application process, possibilities to support the workshop or other inquiries, the organizing team can be contacted via email (SSDW@irs.uni-stuttgart.de).